1802 Company established by John Bradley (1769 -1816) who became managing partner; finance was provided by Thomas Jukes Collier (1761-1845) and the trustees of his stepfather, Henry Foster (1743-1793), each with a third share in the company. The company set up a forge, steam engine and mills. Initially it converted pig iron into wrought iron plates and rods for local industry. Expansion was rapid and leases were secured on further forges and land. 1818 James Foster (1786-1853), son of Henry Foster and half-brother of John Bradley, oversaw the construction of two new blast furnaces, thereby controlling all stages of iron production. 1819 Foster went into partnership with John Urpeth Rastrick in 1819 to expand Bradley's involvement in machinery production. Rastrick was the resident managing engineer of a new company, Foster, Rastrick and Co, built alongside the Stourbridge Iron Works. 1821 A new foundry was built to cope with the expansion of the business. The company produced bedsteads, cooking plates, wheels and tools, rails and railway sleepers. 1827 James Foster and Henry Bradley became co-partners in the trade of ironmasters, under the name of John Bradley and Co.
1828 Coal Masters, and Iron Master, of Stourbridge Iron Works. 1831 Foster, Rastrick and Co. was formally dissolved on 20 June. 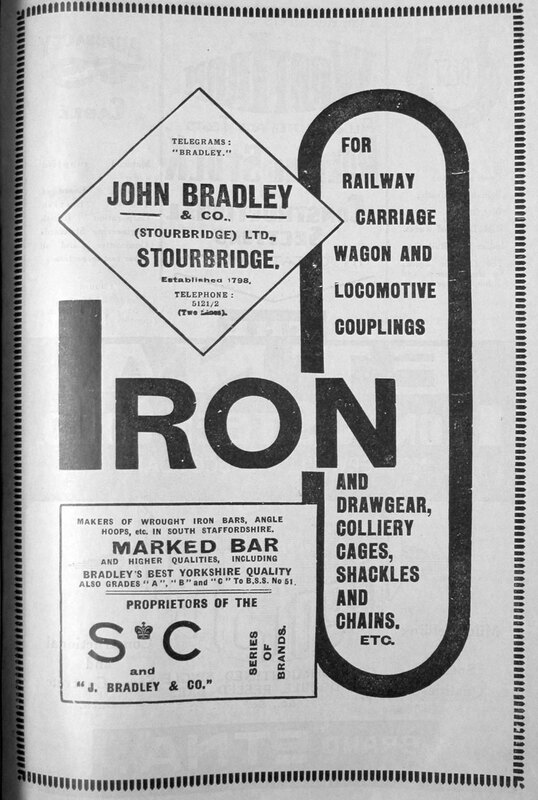 The assets were transferred back into the Stourbridge Iron Works with the foundry business continuing under the management of John Bradley and Co where James Foster was the major partner with Collier and Henry Bradley. Supplied many of the early railways with the first rails, chairs and accessories. Charcoal rods supplied for the first American cable. 1832 Deed of co-partnership  dated 3rd May between: James Foster of Stourbridge, Worcestershire, Ironmaster, and Henry Bradley of Wollescott, Oldswinford, Worcestershire, Ironmaster. 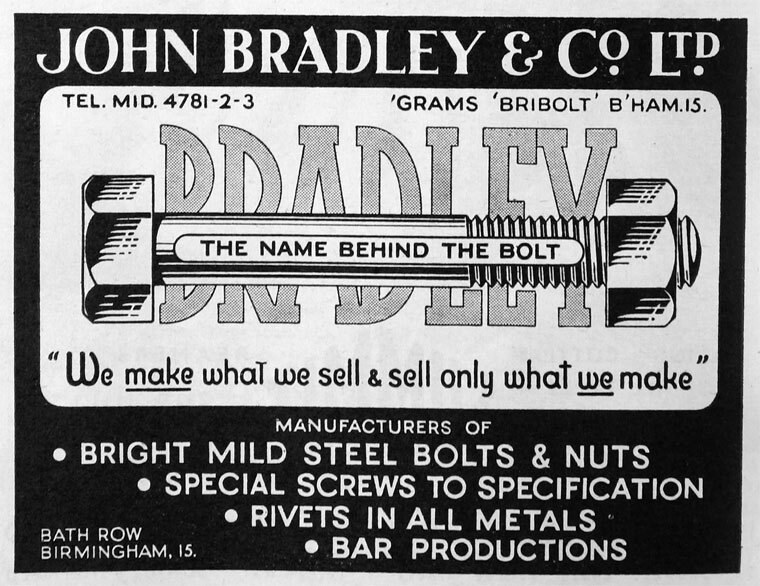 From 1st January 1827, James Foster and Henry Bradley had been Co-Partners in the Trade of Ironmasters, under the name of John Bradley and Co. They had equal moieties in: Freehold tenements, buildings, lands, steam engines, mills, forges, furnaces, mines, ironworks and premises at Amblecote, Oldswinford; Shutt End, Scotts Green and Brettell Lane, Kingswinford; Dudley, Worcestershire; Eardington and Hampton Loade, Shropshire; all belonging to the several works of the Company. The Works were known as: The Stourbridge Old Works; The Stourbridge New Works; The Stourbridge Foundry; The Shutt End Colliery; The Scotts Green Colliery; The Brierley Ironworks; The Baptist End Colliery; The Eardington Works; and The Hampton Loade Works. 1835 Iron founders and manufacturers of iron hoops and bars, of Stourbridge Iron Works, and coalmasters and ironmasters of Stourbridge Iron Works and Shutt End Furnaces. 1843 4 puddling furnaces were relit at the Stourbridge Iron Works. 1853 Foster's nephew, William Orme Foster (-1899), inherited the £700,000 estate and under his stewardship, John Bradley and Co continued to grow. 1870s When the iron industry entered a slump, the productivity of the company declined. 1899 After the death of William Orme Foster, his son, William Henry Foster (1846-1924), took on the company. 1913 Preferring other pursuits, William sold the company's collieries to Guy Pitt and Co.
1919 Sale of the business by William Henry Foster to Edward J. Taylor of Wollescote Hall near Stourbridge for £15,000. 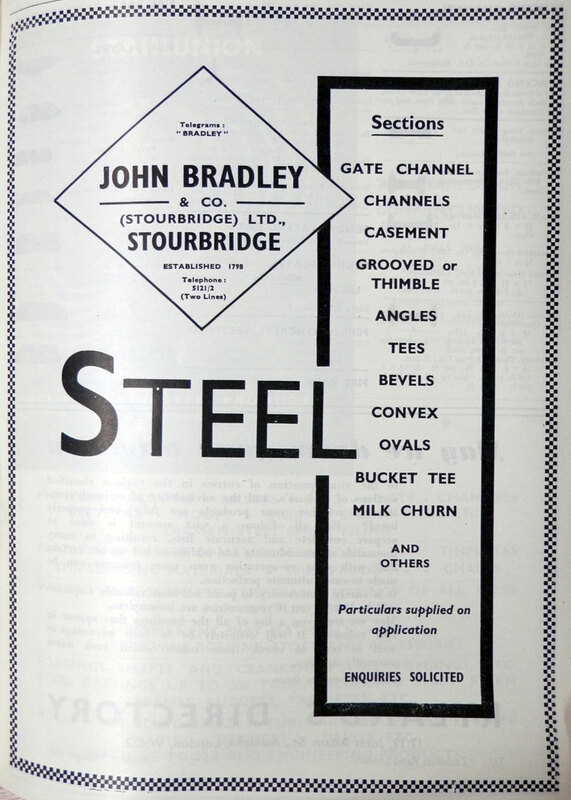 1919 John Bradley and Co (Stourbridge) Ltd was registered on 11th October 1919; founder members were: Edward John Taylor of Stourbridge, Chain Manufacturer; Richard Lowndes of Beauty Bank House, Stourbridge, Iron Manufacturer; and William Frank Taylor of Lynwood, Kidderminster, Chain Manufacturer. 1920 Acquired by N. Hingley and Sons together with E. Baylie and Co Ltd.
1926 - December. The works of John Bradley and Co which had been standing idle since the end of April, in consequence of fuel shortage, resumed operations in the second week of December this year. Some subsidiary works of the company ran intermittently during the coal stoppage. This page was last edited on 9 May 2018, at 09:50.